We trust our doctors. We should. Most doctors are dedicated to helping people. In Huntsville, we are fortunate to have excellent medical professionals. This post is not about those dedicated doctors (the vast majority) who treat and help their patients. This post is about the rare (but extremely harmful) doctor who earns his/her living not by treating patients — but by selling biased and false opinions for insurance companies in an effort to mislead courts and juries. These paid insurance experts are usually not local. And, they usually don’t provide treatment to real patients. Every profession has a few bad apples. When it comes to these “paid biased experts,” their impact harms the entire justice system. I’ve cross-examined these biased, paid experts for many years. 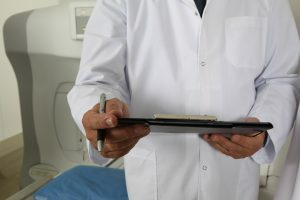 A recent news article in Nevada highlighted a doctor in that state who was banned from testifying by two local judges. In banning this paid expert, the Nevada judges issued a blistering opinion. The judges found the paid expert gave opinions based “heavily on speculation and other irrelevant factors.” They also found the insurance expert had a “history of personal bias as to some treating physicians and extreme bias” against plaintiffs. In conversations with treating physicians over many years, I can tell you that many dedicated physicians share my disgust with biased insurance company paid experts who offer nothing but speculation in court. It’s good to see judges take a stand when the same paid expert appears over-and-over to offer the same recycled speculative opinion against the real treating doctors. This insurance industry practice is wide-spread. These biased experts subvert the truth and serve a dual purpose. These witnesses both drive down injury settlements and cast doubt at trial. Most billboard lawyers (who will not go to trial) simply accept a smaller settlement based on the fake, negative medical opinion. That’s wrong. Then, again, most billboard lawyers won’t fight for their clients. In cases with a lawyer who will go to trial, the insurance companies use the biased experts to create doubt for the jury. Doubt about the plaintiff’s credibility. Doubt about the opinions of the treating doctors. Doubt about the extent of any functional problems, disability or pain. It is essential for your lawyer to work hard at exposing these biased witnesses. Hard work, preparation and a willingness to expose the biased expert make a huge difference in personal injury cases. In recent years, I’ve cross-examined biased insurance industry medical experts in several different specialties. The opinions some of them tried to sell the court are really outrageous. These “medical” witnesses included defense experts offered in fields such as neuropsychology (the testing of traumatic brain injury patients), occupational medicine, physical rehabilitation, pulmonary problems, occupational therapy and even chiropractic care. The key to exposing these fake experts and building your case is preparation, preparation and more preparation. If you have suffered a serious personal injury, you need a serious attorney who will challenge biased insurance company experts. Your case may depend upon it. Don’t settle for one of the billboard or television lawyers who all make the same short-sighted promises. Do your research. Look for an attorney who truly specializes in personal injury trial work. Look for an attorney who works hard for his/her clients. Look for an attorney willing to represent clients in actual trials and appeals.